Music can be a powerful tool for rehabilitation therapy. 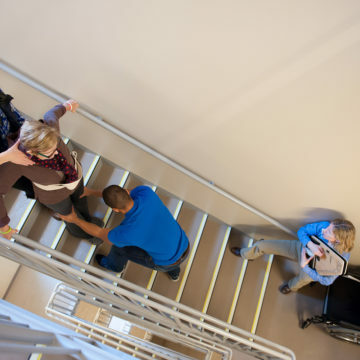 At Craig Hospital, neurologic music therapy programs help support patients with brain injury in their rehabilitation and recovery of non-musical functions. The program is also used to co-treat with other therapies. 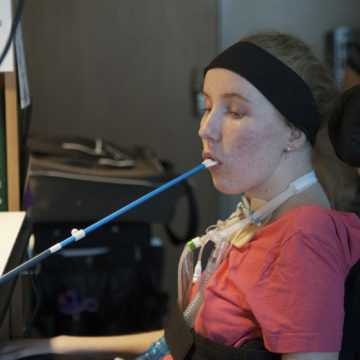 Sarah Thompson, a board certified music therapist, neurologic music therapist and Certified Brain Injury Specialist at Craig, said music therapy can help improve patient’s overall rehabilitation and facilitate movement, increase people’s engagement in their treatment and provide an outlet for expression of feelings. “Often we have patients who can’t speak or have a hard time getting words out but can still sing. We work with these patients to use singing to help regain their ability to speak again,” she said. This is just one example of how after a brain injury musical ability can sometimes be left intact. Neurologic music therapists use this processing to try to elicit responses that may not come out in other therapies. By using this neuroscience approach – all elements of music can be used as a tool to help get the brain organized. Music therapists are proficient in multiple instruments, including guitar, piano, drums, voice and more, and they are able to use these options to tap into a patient’s preferred music. “Our brains respond more to music we like, so by using different instruments and music genres we can find the right tool for a patient’s individual needs,” Sarah said. Melody and pitch are processed in areas that also process prosody (the patterns of stress and intonation in a language). Melody and pitch can be very effective at helping to re-train the prosody and inflection that are key to conveying meaning when we speak. Harmonic structure is key for cueing a response and can often elicit fairly automatic responses when used in the presence of an overlearned song. Rhythm is processed in areas of the brain that also process motor planning, motor coordination and general motor movement. Rhythm is a powerful tool for motor rehabilitation. Volume translates very well into force for motor or respiratory function. The music therapy program at Craig uses live-music experiences to help patients reach their existing goals by transferring activities to normal daily life. “Rhythm is connected to motor movement. In therapy we may have a patient hit a drum to help gain control of an arm so the patient can then use what was learned to do other things like reach for a cup of water,” said Sarah. “We also use rhythm for helping TBI patients to work on walking. A patient who can only walk 200 feet without music may be able to walk 700 feet simply by adding rhythm,” said Sarah. Learn more about how to support the music therapy program at Craig.